Many small businesses can’t afford large advertising budgets, and worry about “missing out” when it comes to promoting themselves online. Are you one of them? By engaging new customers with ads based on their browsing behaviour and the content they’re already consuming, display advertising is an excellent way to promote and raise awareness for business brands on a budget! Display ads laser target online users through demographics like their age, gender, interests, location, and likelihood of becoming a customer. This means viewers will only see ads they have an interest in, and you won’t blow your advertising budget serving those valuable impressions to the wrong audience. Included is the ability to set up geo-fenced conversion zones in the real world, which are able to confirm when a user views an ad and then visits your actual business, proving the ROI. 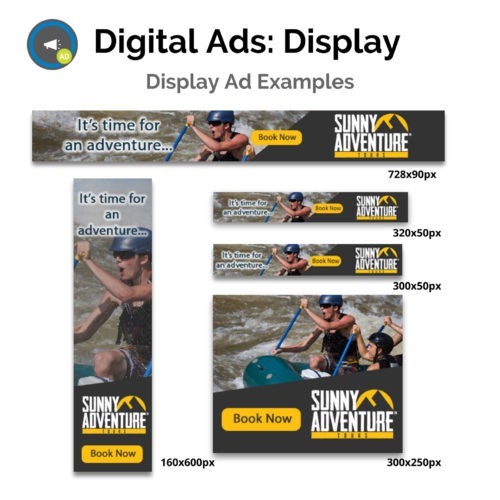 Display ads are also a great way to promote your existing content as a “native ad”, giving you the ability to engage with a larger audience than organic search. Ask us about our fully managed service, created to help you take advantage of the digital advertising landscape. Using industry-leading technology, our team will create the banner ads for your business, manage the ads campaign, and set up monthly reporting so ad performance can be tracked. » Use geofencing to set display ads to trigger in a select geographical area, like a competitor’s business or a relevant event (ex: sports or music venues). » Display ads act as billboards, creating brand awareness for businesses. » Monthly reporting allows you to track interactions with the display ads, and use the data to strengthen the effectiveness of the campaign. Ready for our team maximize your Display Ad results with a google ads partner? Get A FREE Digital Health Check Up! Need some help getting your idea off the ground? Get marketing tips delivered to your inbox!